Yes first the tragedy, then the farce. Eli: So the 27th floor again. Everything comes full circle. Alicia: Yes first the tragedy, then the farce. 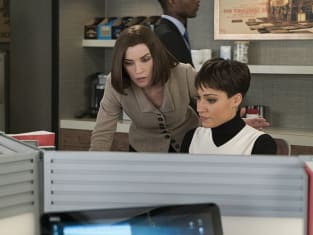 The Good Wife Season 7 Episode 14: "Monday"
Alicia: How do you keep your beard that length. I mean at a certain point you're either clean shaven or you're Abraham Lincoln. Jason: No, it stays like this, since birth. Permalink: No, it stays like this, since birth. Permalink: Yes first the tragedy, then the farce. The Good Wife Round Table: Should Alicia End Her Marriage?